The E-75 International road that passes through Macedonia, is 179 km long and represents a part of the corridor north-south between: Munich - Zagreb - Belgrade - Niš - Skopje - Thessaloniki - Athens. This corridor forms part of the EU-wide "Trans-European Networks" (TENs) and is known as Corridor 10. It's northern point is the border crossing point with Serbia & Montenegro - SCG (FR Yugoslavia), Tabanovce and it's southern point is the border crossing point with Greece, Bogorodica. The Macedonian section of the E-75 road is 179 km long, and has been progressively upgraded to motorway status on a total of 85 km (relation: Kumanovo - Veles - Gradsko). This has been done in general by doubling an existing two lane highway by a second carriageway, sometimes at a noticeable distance from the old one (up to 5 km). This type of upgrading is still underway on the relation Gradsko-Negotino-Demir Kapija-Bogorodica, mostly under EU financing. Traffic levels are respectively 3,300 and 2,000 vehicles a day. 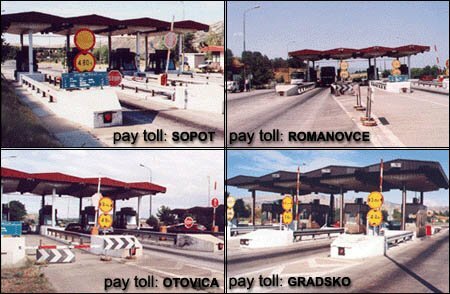 As entering Macedonia from SCG, first that you'll notice is paying a road tax at the Sopot pay toll, north of the first city after crossing the border, Kumanovo. 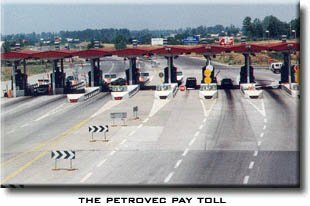 On the way to south after the Romanovce pay toll, there is a huge intersection for Skopje and Veles, so if you choose Skopje the next pay toll will be Miladinovci, or if you choose Veles, the next pay toll that you'll see is Sopot (Otovica is the pay toll some 3-5 km away from Sopot pay toll but in the direction Veles-Kumanovo), in front of Veles, on the way to the Mediterranean. Some 20 km south of Veles, there is the last pay toll in the Macedonian section of E-75, at Gradsko point-Stobi, beside the ruins of the ancient town of Stobi (one of the most attractive archeological site on the Balkan). After the ancient town, the E-75 motorway is following the course of the Vardar river and through Negotino and Demir Kapija Canyon gets to Bogorodica, the Macedonian border crossing point. Important part is the place where the corridor 10 and the corridor 8 crosses each other. That's the eastern exit of Skopje, that splits in two ways, Skopje-Miladinovci section (for Kumanovo, Belgrade on the north) and Skopje-Petrovec section (for Veles, Gevgelija on the south). There is no peripheral motorway around Skopje, but the same is being planned to be built soon. Branch C of Corridor 10 (North-South), from Gradsko to Medzitlija represents the Macedonian road M-5. It's relation starts at the E-75 intersection at Gradsko and passes through Prilep, Bitola and ends at Medzitlija, at the Macedonian-Greek border. This branch of the corridor 10 represents a two lane highway reconstructed in the period of 1985-1990 on its most trafficked section. There are no pay tolls on this relation. The railway on the corridor 10, in Macedonia represents a line on the relation Tabanovce - Skopje - Veles - Gradsko - Demir Kapija - Gevgelija - Bogorodica. This railway today is electrified, modernized and passes by the E-75 motorway. The relation Skopje - Veles - Gradsko - Demir Kapija - Gevgelija, represents a part of the first railway, that was actually built in Macedonia in 1873 (during the existence of the Ottoman province of Macedonia), on the relation Skopje - Solun (Thessaloniki). A branch of this railway is the railway Veles - Prilep - Bitola - Medzitlija, that connects this Macedonian cities with Solun (Thessaloniki), and the part from Prilep - Bitola - Medzitlija, is passing by the M-5 road. The Bitola - Solun (Thessaloniki) railway was built in 1894. 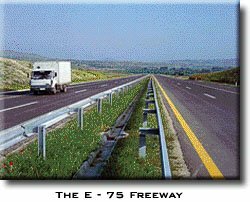 The E-65 International road that passes through Macedonia, is 276 km long and represents a part of the corridor east-west between: Durres - Tirana - Skopje - Sophia - Varna. This corridor forms part of the EU-wide "Trans-European Networks" (TENs) and is known as Corridor 8. It's western point is the border crossing point with Albania, Kjafasan and it's eastern point is the border crossing point with Bulgaria, Deve Bair (also known as Ramna Niva). The Macedonian section of the corridor 8 is 276 km long, and has been progressively upgraded to motorway status on a total of 108 km (relation: Gostivar-Tetovo-Skopje-Kumanovo). This has been done in general by doubling an existing two lane highway by a second carriageway. The corridor passes through Struga - Kičevo - Gostivar - Tetovo - Skopje - Kumanovo - Kriva Palanka, with a stretch in common with Corridor 10, from Miladinovci to Kumanovo. Traffic level on both sides, Kjafasan - Struga and Rankovce - Deve Bair are 1,500/2,500 vehicles a day. The so-called Central Route of Corridor 8, by opposition of the Northern route defined above (Struga - Kičevo - Gostivar - Tetovo - Skopje - Kumanovo - Kriva Palanka), with the Ohrid - Bitola link between the two corridors, and the Veles - Kočani - Delčevo link towards Bulgaria and branch B of Corridor 4. The above two links are partly standard two lane highway, partly substandard, mostly east of Kočani, where traffic is nevertheless 4,000 vehicles a day. The railway on the corridor 8, in Macedonia represents a line on the relation Kumanovo - Skopje - Tetovo - Gostivar - Kičevo. The railway on the relation Skopje - Kumanovo existed even from the distant 1873, while the rail Skopje - Tetovo - Gostivar was built in 1919, just after the first world war, and later in 1920, that railway was upgraded to Kičevo. There is plan for upgrading of existing rail roads and construction of a new rail roads on the corridor 8. 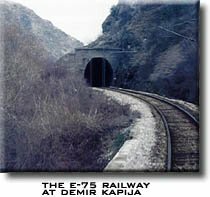 It is suppose to a reconstruction to be done of the already existing 30 km-long Kumanovo - Beljakovce rail road line, construction of a new 55 km-long line between Beljakovce and Deve Bair and construction of a new 66 km-long line between Kičevo and Linn (Albania). 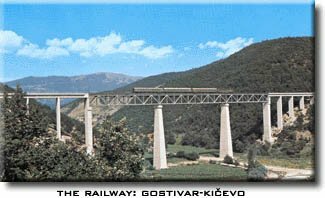 Also on the so-called central route of the corridor 8, exists the railway on the relation Veles - Štip - Kočani, in the eastern part of the country. *Use the map on the top of this page. If you travel to Macedonia by an airplane, you can get to Skopje and Ohrid, because there are only 2 airports built on the territory of the Republic of Macedonia. The Petrovec airport is the first and larger, built in 1928. It's located in the surroundings of the capital, Skopje, 17 km away from the city and is built on an altitude of 238 meters above the sea level. The first airplane that landed on this airport was flying on the relation Skopje - Belgrade. The airport encompasses runaway 2,450 meters long and 45 meters wide, system of taxiways and platform with 15 stands for all types of aircraft (starting from the general aviation up to B747 and AN 124). During the winter, particularly in February there is a haze. The last reconstruction dates back from 1996 - 1997, when the entire lighting signalization for second category was installed, and with the other construction activities the airport is enabled for taking off, landing and maneuvering of all aircraft types. The second airport in Macedonia, is built in the surroundings of Ohrid, 9 km away from the city, on an altitude of 708 meters above the sea level. It's smaller than the airport Petrovec in Skopje. The Ohrid Airport has one runaway 2,550 x 45m with one entrance and exit on the platform, which has 13 stands for the aircraft of the general aviation to the TU 154 aircraft. The last reconstruction was performed in 1989 - 1990, when lightning system of first category with simple approaching lights were installed. The other features enable taking off, landing and maneuvering with referent type of aircraft - TU 154.